Elephanta Caves the famous UNESCO World Heritage Site located on Elephanta Island is located about 10 km from Mumbai City. The caves are famous fro centuries old Hindu and Buddhist caves with amazing rock cut architectures and carvings. 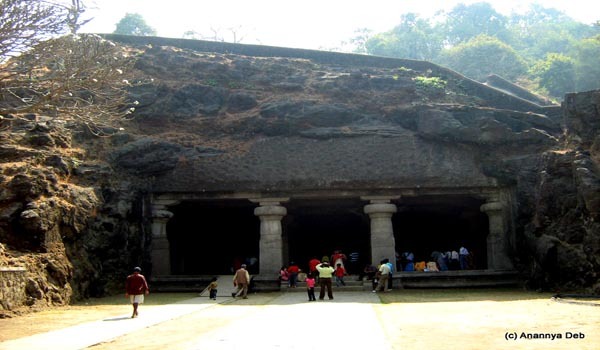 The caves dated back to between the 5th and 8th centuries and are the prime attractions for tourists coming to Mumbai. The Hindu Caves contain rock cut stone sculptures, representing the Shaiva Hindu sect, dedicated to the god Shiva. It is currently maintained by the Archaeological Survey of India (ASI). There were seven caves found in the excavations. Elephanta caves have been dated back to 5th to late 8th century AD by historians but its actual date and architect are still in debate. There are about 7 caves that have been excavated which were made of the solid basalt rock and were beautifully painted in that time but now traces remains. Cave 1 is the most notable cave here which has four doors at the entrance and have beautiful rock-cut architecture, and exquisite and vibrant sculptures dedicated to Lord Shiva. The other carved sculptures inside the main caves are Andhakasura Vadha murthy; Shiva in the form cosmic dance of Nataraja; Kalyanasundara murti; Gangadhara murthy; Ravana shaking Kailasa and Siva as Lakulisa. The Buddhist caves are located in eastern part of the island . Elephanta caves can be reached from The Gateway of India and are open from 9 A.M. to 5 P.M. . For the Citizens of India and visitors of SAARC (Bangladesh, Nepal, Bhutan, Sri Lanka, Pakistan, Maldives and Afghanistan) and BIMSTEC Countries (Bangladesh, Nepal, Bhutan, Sri Lanka, Thailand and Myanmar) – Rs. 10 per head. And for other nationals it is US $ 5 or Indian Rs. 250/- per head. Help us to improve this article/list "Elephanta Caves Mumbai". We would be glad if you can comment below and provide your valuable suggestions and feedback. If this page about Elephanta Caves Mumbai have any wrong information/list or out of context content, then you can report us as well.